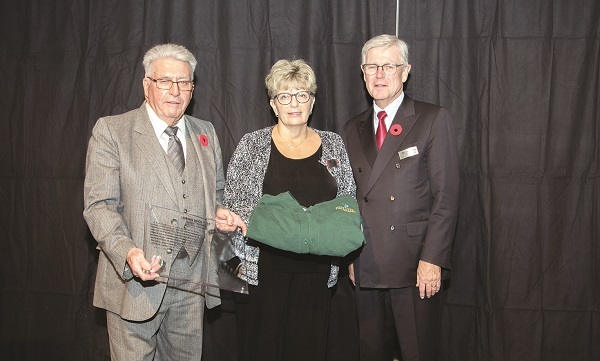 Connections past and present marked the inductions of both basketball coach Robert Bain and late ex-NHL linesman Loring Doolittle into the Aurora Sports Hall of Fame, made official at the annual induction dinner last week. Passionate about both hockey and his hometown, where his legacy is forever cemented in Loring Doolittle Court, friends and family were given the opportunity to share the legacy behind the name with the hundreds of guests in attendance. An emotional Claire Doolittle took to the stand to remember his late older brother, along with Loring’s daughter, Cathy. He recounted Loring’s relationship with fellow linesman George Hayes, the first official to work one thousand games in the NHL. Standing on the podium beside the portraits of new and former Hall of Fame inductees, Claire was driven to tell a story when he saw the face of ex-NHLer Bob Wall, an inductee to the 2017 class. “Bob and I went to high school together in Aurora,” recalled Claire. When Loring’s career took him to the west coast after the NHL’s expansion into California, he and Mr. Wall met up once again when Mr. Wall was playing with the Los Angeles Kings. “The story I got from my brother was, he came up and nudged Bob Wall and he said ‘any crap from you tonight and you’re going back to the bush league in Lake Wilcox,” said Claire, referring to the Oak Ridges community. With both mom and dad, and five other siblings, watching that game in the famed Los Angeles Forum, Claire said the hometown connection was something special. Above all, Claire said he looked up to his older brother for his leadership. For Mr. Bain, the hometown connection also runs deep in his blood. It was former head chair of Sport Aurora that certified his coaching license through the National Certified Coaching Program (NCCP). Yet despite almost forty years of coaching including multiple titles with the Yeomen, Mr. Bain said he was “shocked” to be standing at the podium. Yet Mr. Bain said it was exactly his relationship with his players that have helped him earn his second hall of fame induction. He also made sure to thank his family in attendance, including his wife Linda, who spent many years volunteering with the York Yeomen. Lastly, he thanked and gave praise to not only the volunteer staff and students that have assisted him over the years, but the volunteers that helped put together the sixth annual induction dinner. “I had no idea what this event was about. What an incredible evening. My wife and I are shocked at the grandeur of the whole event…I’m extremely impressed by the quality of the people inducted before me. Mr. Doolittle and Mr. Bain join triathlete Paolina Allan and pro golfer David Morland IV as this year’s class of inductees into the Hall.